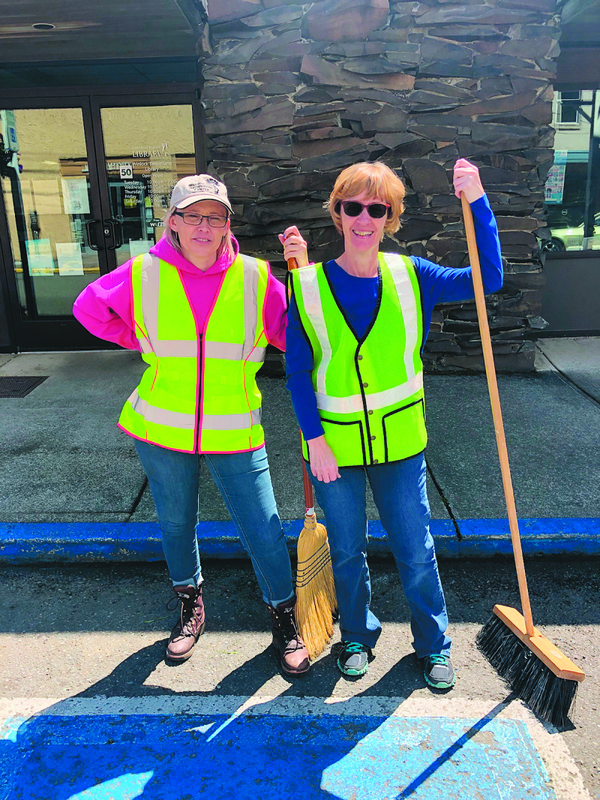 Cris Dodd and Stormy Bradley, Winlock City Office Staff is getting the streets ready Egg Day. The Egg Day Celebration begins at the Winlock Community Building located at 607 NW Kerron Avenue, on Friday, June 15 at 7:00 p.m. with the coronation of the new Egg Day Queen and court. Elizabeth Wolfe, the current Egg Day Queen, will give up her title to either Princess Chloe Thomas or Princess Elora Smith. The Library is having their Annual Egg Day Book Sale starting Friday and Saturday from 9:00 a.m. to 5:00 p.m. located at 300 NE First Street (in the Roundtree building, adjacent to the post office). This fundraiser helps the library all year long. Stop by and purchase a book to support your local library. Parking by donation to Winlock Improvement Network (WIN) will be available on Saturday beginning at 8:00 a.m. at 305 E. Walnut (across from Cedar Village IGA). This is WIN's largest fundraiser for the year in its Winlock revitalization efforts. Come early, as parking spaces are limited. Attendants will be available. Park at your own risk. There will be no Winlock Saturday Market on Egg Day. There will be a big change this year in reference to the vendors. The vendors will be on NE First Street downtown on the west side of the street. The vendors will be taking up approximately one-third of the road to allow room for the parade to pass. Vendors will sell food, drinks, bird houses, gifts, quilts, soft serve ice cream, elephant ears (our favorite), and much more than can be name here. There will be informational booths, as well. The festivities on Saturday, June 16 are many, starting at the Olequa Senior Center from 7:00 a.m. to 10:00 a.m. for a pancake breakfast. The cost is $6 for adults and $4 for children. Registration for "The Future is in the Egg" walk/run 5 mile race begins at 7:30 a.m. and the race starts near Grinders Espresso at 311 NW Kerron Street at 8:15 a.m. Registration begins downtown on Front Street at 8:00 a.m. for the Winlock Custom Car Show. The pre-parade Royalty reception will be held at Umpqua Bank starting at 9:00 a.m. The Winlock Historical Museum is open on Egg Day from 10:00 a.m. to 2:00 p.m. If you have not visited the downtown museum, this is your opportunity to see it and learn more about the history of Winlock. Parade check-in is from 8:00 a.m. to 9:45 a.m. on the corner of Front Street and Cowlitz Road, with floats and other parade entries lining up on SE First Street. The parade begins at 11:00 a.m. This is the activity all of us enjoy! You will see everything from horses to vintage automobiles to log trucks. After the parade, the Egg Day Committee and volunteers will give away egg salad sandwiches at IGA. Lewis County Fire District 15, Winlock, will be hosting an Open House Safety Fair after the parade at the Fire station next to the Community Building. There will be demonstrations for kids and information about fire prevention. This is also a great opportunity for kids and adults to meet our local firefighters. There will also be Karaoke after the parade hosted by Judie and Dave Clevenger at the parade judges viewing stand on NE First Street. From 12:30 p.m. to 2:30 p.m. Mr. Twister will be creating balloon art at Volunteer Park next to Bark Avenue. The Renegade Rooster Museum at 558 Rhoades Road, Winlock, will also be open from 1:00 p.m. to 5:00 p.m. The Renegade Rooster has the largest history display of Winlock memorabilia. Roy Richards, curator, has worked tirelessly for years gathering Winlock's historical items. It's definitely worth your time to visit the Renegade Rooster. To end the evening, The Club will have their annual Street Dance on NE First Street starting from 9:00 p.m. to close. Egg Day is a special time of year for many of us. Alumni return for reunions and newcomers to Winlock will get to participate in their first Egg Day. It's a day that you will remember for years to come. Now, if only Danny Voie would bring back the Rainier Beer that would make the Egg Day parade a moment to remember for the rest of our lives! !